SYNOPSIS: When six-year-old Kate Woodville’s beautiful sister Elizabeth makes a shocking—and secret—marriage to King Edward IV, Kate and her large family are whisked to the king’s court. Soon a bedazzled Kate becomes one of the greatest ladies in the land when she marries young Harry Stafford, Duke of Buckingham. But Kate’s fairy-tale existence as a duchess is shattered when the ongoing conflict between the houses of Lancaster and York engulfs the Woodville family. As Edward IV fights to keep his crown, Harry’s relatives become hopelessly divided between Lancaster and York. Forced constantly to struggle with his own allegiances, Harry faces his defining moment when his dear friend Richard, Duke of Gloucester, determines to seize the throne for himself as Richard III. With lives in jeopardy and nothing less than a dynasty at stake, Harry’s loyalties—and his conscience—will be put to the ultimate test. My thoughts: Susan Higginbotham is batting three for three! 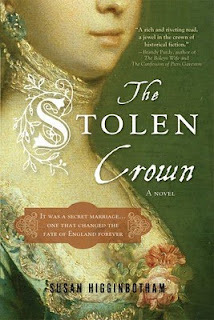 The Stolen Crown is my third Higginbotham read and my third 5 star rating! In her third book Higginbotham takes on Katherine Woodville and Harry Stafford, Duke of Buckingham, two lesser known players in the Wars of the Roses. Katherine is the younger sister of Elizabeth Woodville, who was secretly married to King Edward IV of England and Harry is commonly known as one of the suspects in the Princes in the Tower debate. I found it very interesting to see the actions of Richard III after King Edward IV died through the eyes of Harry, his close friend. As you can imagine with Harry on one side with Richard III and Kate on the other with her sister, Edward's widow there was quite a family divide. Harry would eventually turn away from Richard III and rebel against his actions which would lead to his ultimate downfall. Kate was a very likeable heroine, in fact all of the characters were if not likeable then understandable (even Richard III). They are fantastically real and not the typical stereotypes that they are often attached with. Even if you don't necessarily agree with their thoughts and actions, you can grasp where they're coming from and for me that just shows how perceptive and understanding Susan is as a person. True to form, Susan's writing draws you in and takes you on a fantastic journey through the lives of these two intriguing historical figures. The Stolen Crown is a perfect mix of strong characters, eloquent dialogue tinged with Susan's wonderful humor and meticulous research and I recommend to all lovers of historical fiction! I am super excited that Susan will have a new book coming out on January 11, 2011 titled The Queen of Last Hopes , which will be about Margaret of Anjou. Please visit Susan's WEBSITE and BLOG. They are both entertaining and very informative, just like her books! FTC DISCLOSURE: Thanks to Susan Higginbotham for sending me a copy for review and for the hours of reading enjoyment! I really enjoyed this one as well and can't wait to read her book on Margaret of Anjou. Have a great weekend! Thanks for the review, Amy, and thanks, Daphne & Blodeuedd! I LOVED this one too. I can never again see Harry in the same light, never ever. Great book and I gave it a five too just like Hugh and Bess. I certainly need to get the chance to read one of her books! I really enjoyed this one too. Susan is a wonderful writer. I can't wait for the new one! This is the first book I have read by Susan and I am now looking forward to reading all of her other books. I really enjoyed it! i LOVE SUSAN's book! i have read only 1 :( but I am sure I will like the rest too! And this one is definitely going into my wish list! I SO WISH I could buy this NOW! I need to check my shelves to see if I have any of her books. Knowing me, I have some in there somewhere. thanks for the review and letting us know about these books.